Superman and Lex Luthor reveal their enhancement project to the rest of the League. There is some debate about the use of "magic pills" to make ordinary people superhuman, but the League seems to acquiesce with the exception of Robin (Damian Wayne), who takes a sample pill and makes off for the Batcave. Hawkgirl notes that Robin has teleported to Batman after he has left. Once in the Batcave, Robin reunites with Alfred and then his father, Batman. They attempt to discuss the events that have left them estranged, but Robin loses his temper, and when Alfred tries to calm him with a touch to the shoulder, Robin throws him with superhuman force into a large monitor. Batman tries to intervene but Robin punches him into the giant penny. The penny is about to crush Alfred, but Hawkgirl arrives and saves him, holding the penny above her head. Hawkgirl attempts to leave with Robin, but Damian deduces that Hawkgirl is an impostor, and with an incendiary device, reveals the Martian Manhunter, and escapes. Story - 2: There's a lot to be said for repetition, especially in Literature and the Arts. Repetition used effectively can make a theme more engrossing, round out a flat character, and in many cases builds discipline on the part of many writers. Injustice, in this issue, repeats not just things that have been addressed last issue, but things that were addressed several issues previously. For instance, Superman wants to save more lives now and he's willing to do morally questionable things to get it done, like killing or making a super-drug to dope-up normal people, so he can have his own "peace force". Damian Wayne is a loose-cannon with extreme issues with his father, who has extreme issues of his own. Alfred is a wise older man, who needs to say a few pithy things, and then get out of the Batcave. All of this has been established early on, so the fact that we have an issue that addresses it all over again, with little advancement of the storyline, is off-putting to say the least. The big reveal of the Martian Manhunter could have been better, but it's overshadowed by facts that any reader of JLA would know. The Nth metal that powers Hawkgirl's wings also gives her superhuman strength. She could handle the weight of the penny, much as she does here. It's also curious how Manhunter gains access to the Watchtower, and no one knows that it's him. The teleporter is programmed to respond to each Leaguer specifically, if not, a villain could do the same as J'onn and access their base. Superman's senses should have easily detected him, and the final question begged is how Robin knows to use a flame weapon, based on Hawkgirl's show of strength and knowledge of the Batcave. It shows that she's an impostor, but not much else as to whom she truly is. For all we know, Batman could have recruited Clayface. Taylor's story has prompted some very intriguing questions, but he seems to be reluctant to answer them, or just unable. 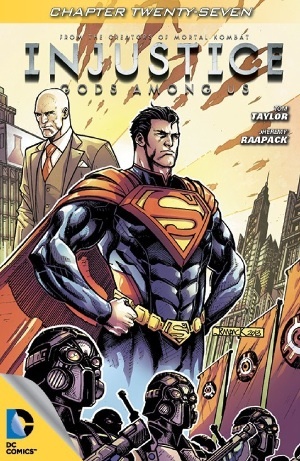 It's a paradoxical premise, where Superman has done the wrong thing but has been right in doing it; a brief and panoramic reflection of the allowances the average person gives to their respective society in return for things like safety and street lights. However, to quote the good Father Fanning, "You can't keep coming back from being down," and this story has been down for some time. We get an issue with streaks of brilliance, only to be followed by three issues of malarkey. NOTE: If you're still playing Injustice for the iOS, check out the latest update. You get Batgirl as a FC, if you can win 60 battles of her challenge run. Art - 3: The inks on Raapack's pencils look as if a newborn drooled them, but it's surprisingly fitting. Batman looked crazed, Alfred looks half-dead even before Robin strikes him, and Damian looks like the petulant apple-jack he's being characterized as. Cover Art - 4: I just noticed that Lex is standing next to a beaker. More on that next review.